On Tuesday, the Boston Bruins announced that they had signed veteran forward Dominic Moore to a 1-year, $900,000 deal. Moore is more of a bottom six forward, who will give you some solid minutes, a good faceoff percentage and will chip in some points from time to time. Last season with the Rangers, he posted 6 goals and 15 points, well out of range of being pool worthy, but with the Bruins, there is some potential through the lineup to pick up a few more minutes and possibly increase his numbers. At age 36, we're not expecting him to blow off the doors of any building. The Calgary Flames added another name to their training camp roster on Tuesday, extending a camp invite to forward Chris Higgins. The 33-year old spent most of the 2016 season with the Canucks' AHL affiliate in Utica, but did manage to appear in 33 games for the big club, scoring 3 goals and 4 points in that time. His role diminished rather quickly in Vancouver and it would be a pretty tough grind to make it into the Flames lineup, but it certainly wouldn't be impossible. Chalk up another chance for Raffi Torres, as the Carolina Hurricanes have given the much maligned forward an invite to their camp. The 34-year old forward spent his 2016 season in the Toronto Maple Leafs organization, failing to play in the NHL at all. The Hurricanes are definitely moving towards a younger team and they haven't been a team known for their outlandish behaviour, so it also seems unlikely that a guy like Torres will find a job there. But that's why they have training camp, just to figure those things out. Another player carrying some baggage to a training camp would be forward Jarret Stoll, who got an invite from the Columbus Blue Jackets on Tuesday. Stoll managed to play in 80 games for the Minnesota Wild last season, but was hardly noticeable, scoring 4 goals and 9 points in those games. Stoll would have an uphill climb into this roster, after they had already signed on Sam Gagner and they'll look to their AHL farm club, which won the championship, to help fill in their roster. Hey all you poolies out there! Here is the announcement you've all been waiting for! Okay, if you've really been waiting for this announcement, there's a good chance that this has been one of the longest summers ever for you. Last season, the mini-games were somewhat of a success and the goal this off-season was to find a way to make them a little bit better. I was thinking good and hard about it and there was a part of me that thought that announcing what those mini-games were ahead of the draft took the spontaneity out of the competition, as Ryan picked four rookies through the draft and pretty well went wire-to-wire, pretty well guaranteeing his money back, at the least. 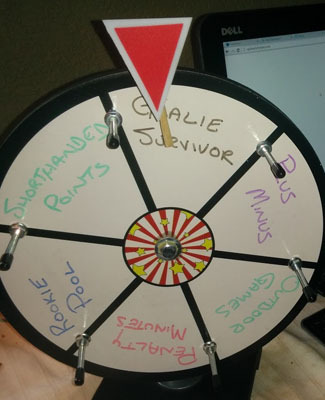 This year, I am going to put that spontaneity back into the mini-games with the Mini-Game Wheel, which will make its first appearance at the big hockey pool draft on October 8th. After the draft has been completed and we all have our teams, we'll have one more small event, spinning the wheel to choose our three mini-games that we'll play. When a game is selected, it will be removed from the wheel and we'll add a new game, just so we have three unique games through the season. The six games, if you can make them out on the wheel there, include the three we had last season, the rookie pool, the PIM pool and the goalie survivor pool, and then I added the outdoor games, a plus-minus competition and shorthanded points, just as examples. The intention is to make sure everyone is paying attention to the draft itself, as we go along and the mini-games are to be that bonus. There is no stopping a team from taking four rookies again through the draft, nor is there any reason why you couldn't load up on teams that will be playing an outdoor game (Edmonton, Winnipeg, Montreal, Toronto, St. Louis or Chicago), but you're taking a pretty good gamble, assuming that that slot will stop on the wheel. I was hoping that the mini-games would be a good add for those teams who are not necessarily in the money and give them something to play for and I hope with the addition of this wheel, it will certainly bring a little bit more excitement to the season. There was a fair bit of stirring, when the roster for Team USA was announced and Pittsburgh Penguins forward Phil Kessel wasn't on it, but it was seemingly obvious why, when the announcement came that he was to undergo hand surgery. On Monday, a cryptic update came down the pipe on Twitter from one of the beat writers, suggesting that Kessel wasn't just dealing with a hand problem in this off-season, but of course, details were not easy to come by. Nevertheless, Penguins GM Jim Rutherford was suggesting that he would be ready to go at the start of the season, but cryptic messages are not good at any point. This will be something worth monitoring, especially if you think Kessel is to really pick up his socks this season in the scoring department. 59 points last season may have been underwhelming to some and my early projection is for 65 points and I think right now, it has a better chance of going down than up, with this news. A tweet (see below) this morning from one of the best beat writers in the game, Joe Haggerty in Boston, is suggesting that David Krejci is rehabbing from some off-season surgery of his own, of the hip variety. With a little bit more research, it was showing that he did have his procedure at the end of April. He is on the ice already, which is certainly a good sign for his recovery and he is yet to be replaced on the Czech Republic's World Cup team, so everything must be on track for him to play, but we'll keep you posted on new revelations, as they come up. April also saw shoulder surgery for defenseman Torey Krug, which was to repair a torn labrum. The initial rehab schedule was for six months, which would be into October and it sounds like he is making progress to be ready or close to ready for the start of the regular season. Of course, there will be the potential for setbacks and it will need to be closely monitored at this point. There is no reason for any projection setbacks yet, we'll have to wait for training camp to open, before we make any of those assessments. On Friday afternoon, the Anaheim Ducks came to terms with their first of two 1st round picks in this year's entry draft, the 24th overall selection, forward Max Jones, signing his 3-year entry-level deal. Jones was a part of that stacked London Knights team that eventually won the Memorial Cup this year, but his 12-game suspension through the playoffs seemingly hurt his overall draft value, as he could have potentially have gone in the top half of the round. Described as an athletic power forward, who needs to focus on his skill, the Ducks have a player that could fit right into the mix eventually. The Ducks are not short on question marks in their projected roster, so the already NHL-framed forward could barge his way in and have an impact right away, if he gets on the right side of the coaching staff. The Calgary Flames added some European flavour to their training camp roster in the off-season, signing Czech forward Daniel Pribyl to a 2-year deal earlier in the Summer, but his availability for the start of training camp is up in the air, as he recovers from off-season knee surgery. The 23-year old had ACL surgery in May, which you would think would be enough time to get healthy for a mid-September start to training camp, but the Flames are not rushing him, wanting him to be 100% when he gets going. He had a big year in the Czech league last year, scoring 45 points in 45 games, which certainly raised some eyebrows on this side of the pond. No projection has been made as of yet on this side, but the Hockey News seems to think he would be good for 34 points this season. After the deal that sent Dave Bolland to Arizona on Thursday morning, there was some confirmation that the veteran forward isn't close to playing, as the lower-body injury (or something very similar) is very serious and will likely keep him out for the better part, if not all, of the 2017 season. This would mean that the Coyotes would then have over $17.9 million in salary, before buyouts, that won't be in the opening night roster or possibly even play in the 2017 season. The Coyotes will get some relief, because Chris Pronger and Bolland are both considered injured and will likely be on the Long Term Injured Reserve at one point or another this season. Bolland's projection has now been zeroed out. It sounds like the foot injury that kept Robin Lehner from the better part of the 2016 season, has not healed as well as he would have hoped and now he is backing out of the World Cup of Hockey to get some extra rest, ahead of Buffalo Sabres training camp. 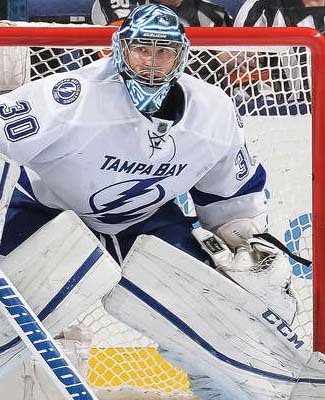 Taking his spot on Team Sweden's roster will be Toronto's new back-up goalie, Jhonas Enroth. In all likelihood, Lehner was going to be the number three guy in the pecking order for crease time, behind Henrik Lundqvist and Jacob Markstrom, but he would have had to go through camp and that might have been a couple extra weeks that he could use for rest and healing instead. This will be a key injury to keep an eye on, as we get closer and closer to the NHL regular season and the hockey pool draft. Only the Swedish coaching staff truly know what they have planned for a crease schedule, so it will be hard to say how much of an impact Enroth will have, if any at all. He could really endear himself to his new home with some good play in Toronto during the tournament, but it just seems very unlikely. He will benefit from an early start to camp though, that couldn't hurt, right? The Detroit Red Wings can't be too enthusiastic about how their Summer has gone, health-wise, among other things, so when forward Tomas Jurco had to undergo "minor" back surgery this week, it was just adding it to the pile. The recovery for this surgery is only 4-to-6 weeks, which could force him to miss the start of the regular season, but not very much after that. The schedule starts on October 12th, which is seven weeks away from today and there is no guarantees that he will be ready. Ideally, the Red Wings will want him to be 100% on his skates, before he takes the ice in a regular season game, so it's a game of wait and see. The Red Wings also got word that one of their prospect defensemen, Vili Saarijarvi, has also undergone wrist surgery and will be out of commission for the next three months. There was no indication that the 19-year old was anywhere near the roster this year, but we really couldn't say that for sure. If you were banking on this youngster to make the jump, he won't be making it out of training camp. It seems to be a little early to be dealing with undisclosed injuries, but late in the afternoon on Wednesday, Hockey Canada announced that Duncan Keith wouldn't be able to participate in September's World Cup of Hockey, due to injury and that Jay Bouwmeester would take his spot on the roster. There was no definitive word on what was ailing the Chicago Blackhawks defenseman, but the release suggested that he was undergoing some kind of rehabilitation and that Hockey Canada wished him luck through it, so we would have to believe it was something. Of course, with no details, we won't know what his availability for training camp will be at this point. In Bouwmeester, Team Canada will get a veteran of the international scene and a fluid skater, who should be able to help the team move up the ice and be strong on the backcheck, keeping up with some of that speed that will be coming back at the team on the counter attack. He may not have been a popular choice for some, but his veteran presence in this sort of tournament is thought to be very beneficial. The list of pool worthy unrestricted free agents is dwindling down, even more so after the New York Rangers came to terms with forward Brandon Pirri, signing a 1-year, $1.1 million deal, according to some reports this morning. In the 2016 season, Pirri was ranked 195th among all forwards in scoring, picking up 14 goals and 29 points in 61 games between Florida and Anaheim. His season did have an injury setback as well, missing out on 13 games, due to an ankle injury, and then an upper-body injury ended his season prematurely, losing out on the last four regular season games and then the playoffs. The Rangers are adding some quality depth, likely in a 3rd line role with some 2nd line upside and there should be all kinds of opportunity, as their lineup has really gone through an overhaul in this off-season. The opportunity for playing time is certainly there, but with this overhaul in progress, it's hard to say when chemistry will be made, how the lines will actually pan out, so it is hard to gauge where the projections should be. I am going to take the cautious approach and say Pirri will be in the 35-point range, assuming he can play the whole season. There is certainly potential for more, but I am not so certain he can reach it right away. I think it has been said on the blog already, but it is really odd to see the Rangers in great shape against the salary cap ceiling. They have a pretty full projected roster, adding another player like Pirri at a very reasonable rate and still having $5.2 million left in space. The Rangers still have Jesper Fast to sign in their restricted free agent list, but he should fit well within those parameters and this team could be both competitive and cost efficient at the same time. Who knew?!? The Arizona Coyotes are taking on another pretty good asset in order to help a team deal with some cap struggles, as they have acquired a former 1st round draft pick in forward Lawson Crouse, while taking on a lump of a salary in Dave Bolland for a couple of draft picks. Crouse, a top end prospect with size and skill, will be a big add to this franchise and certainly has some potential to make the jump into the NHL this season, but the Coyotes are not necessarily going to be a cake walk to join, given the competition in the queue. He will certainly be a player to watch in training camp, as he could potentially be a 30-point player, if he makes the team full-time. In Bolland, the Coyotes will take on a good chunk of salary for the next three seasons and there are some suggestions out there that he may not be ready to play to start the season, as a lower-body injury cost him the last 26 games of the regular season and the opening round of the playoffs with the Panthers and that injury limited his season to only 25 games. Once upon a time, Bolland was a reasonable late round option for the hockey pool, but even if he does play any games this season, he doesn't carry any recommendations for even a sleeper pick. It was a pretty steep cost for the Panthers to move $5.5 million of cap space out, as Crouse does have some real upside to his game. 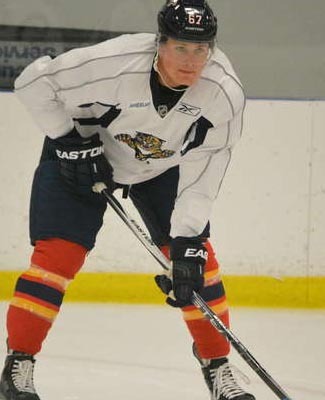 Still, with all of that extra space, the Panthers can really add some talent to help them win this season and they still have a kid like Jayce Hawryluk in the wings, who could make the jump and be one of those rookies that sneaks onto everyone's radar this season. The last word we saw on Detroit Red Wings defenseman Niklas Kronwall was that he was dealing with a knee issue, but surgery wasn't really in the cards and that was back in the middle of May. One would wonder if rehab through the Summer didn't go as planned, as he was replaced on Sweden's World Cup roster on Wednesday, as Anaheim Ducks defenseman Hampus Lindholm will be taking his spot. There has been no word on what the injury to Kronwall will do to his availability for training camp, the preseason or the start of the regular season, but he is going on the list as a player to watch through the start of camp. joining Teemu Pulkkinen as a player on their roster in question and the two long-term injuries to Johan Frazen and Joe Vitale, who they don't expect to have this season. The Swedes are now adding a good up-and-coming defender in Lindholm and is trending the right way in his career path. Last season, the 22-year old finished with 28 points in 80 games and the expectation is that he'll continue to gain in those numbers. The early projections on my end have him at 30 points, but those could certainly change with a good tournament and getting that head start to his year. The top ranked unrestricted free agent has now come off the list on Wednesday morning, as the Dallas Stars have signed veteran forward Jiri Hudler to a 1-year, $2 million deal. The addition of the veteran Hudler confirms the theory that the Stars are going to bring as many guns to every fight, as the talented forward should be able to add a little bit more play-making ability to a team that will be about scoring a lot more goals then their opponents, rather than the playing tight to the vest styles of recent memory. The 32-year old Hudler had a bit of a down year in the 2016 season, splitting time between Calgary and Florida, playing 72 games, scoring 16 goals and 46 points in the year, good enough for 103rd among all forwards. Looking at the lineup, the Stars are likely going to have Hudler somewhere in their top six, but even their top nine is going to look like an offensive force, something that they would probably prefer to have. I think it will be a bounce back year, to a point, where I can see him get 55 points this year in Dallas. He won't get the 70+ points that he had in Calgary, since it won't be top line minutes, but he'll play a big part in the new Dallas offense. The salary cap situation remains fairly fluid with the addition of Hudler to their ranks, as their current projected 23-man roster still has $5.2 million to play with for the rest of the Summer. Valeri Nichushkin is still in need of a new restricted free agent contract, just out of his entry-level deal, which will likely be a bridge deal. There should be plenty of cap space for that deal and then they should be shopping for some better defensemen for the season. At first glance, +The Hockey News pool guide for the coming season is ramping up Connor-mania and it's hard not to look at that cover and think to yourself, "yeah, I think I would take Connor McDavid with the 1st overall pick this year." His finish to the 2016 season left a pleasant taste in a lot of mouths, I would believe and the belief is that he is only going to get better and that could ramp up in a big hurry. 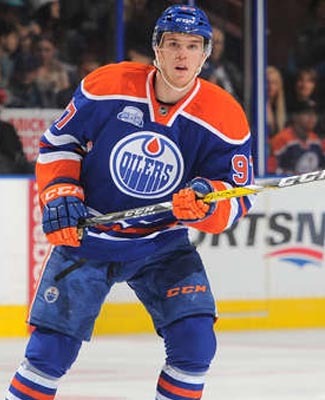 Now, they do project McDavid to lead all scorers in the league with 96 points in the coming season and as much as I think that might be a little high, compared to my previously published projections, it isn't the highest total of points, thanks to my pool scoring system, so don't be fooled. If you go back to goalies, right near the end of the magazine, you'll find that Braden Holtby is projected for 46 wins and 7 shutouts, which would give him 106 points in the pool and he is far and away the best player to take. So, there is that. The goalies, especially the top end keepers, tend to go pretty early at my draft, but if your pool doesn't figure goalies to be quite as potent, then McDavid is the way to go then. So, we'll say Holtby is tops, McDavid is next, then we have Sidney Crosby coming in at 95 points, Jonathan Quick in at 92 points, Patrick Kane down to 90 points, Carey Price returns with 86 points and then Jake Allen & Matthew Murray in at 84 points. Rounding out the top 10 we have Vladimir Tarasenko & John Tavares tied at 83 points. Out of this list, we see that the Hockey News is confident that Murray will indeed unseat Marc-Andre Fleury in Pittsburgh. It looks like the expectations of the Penguins are still quite high, since they have Fleury still picking up another 29 wins, on top of Murray's 37 wins, which suggests a 66-win season. 66-16-0 would be an off the charts year, unless Fleury was to get moved at some point in the year, which would make some sense. To the Hockey News' credit, they did point out that Petr Mrazek was going to take over in Detroit, edging Jimmy Howard out of the number one spot and by the numbers this year, there is no going back, with Mrazek in at 58 points and Howard in at 30. Shall we stay in the crease? Last year, their list was awfully short, only ranking 45 goalies and that wasn't good enough for the participation for the 2015 pool, let alone last season's pool, which saw 27 teams and 54 goalies taken. Looks like they've made up for that, listing 60 goalies, so if we repeat the 27-team season, there will be enough names to go around. Other revelations from their list include Ben Bishop still the number one guy in Tampa, since he's still going to don their uniform on opening night. The Hockey News still has Ryan Miller over Jacob Markstrom in Vancouver, Brian Elliott will win 31 games in Calgary, Antti Niemi will best Kari Lehtonen in Dallas and the pairing of Jaroslav Halak and Thomas Greiss might get much closer to a platoon system. We already saw the top five forwards in the top 10, but Jamie Benn, Johnny Gaudreau (once he's signed), Evgeny Kuznetsov, Nikita Kucherov (once he's signed) and Alex Ovechkin will certainly have something to say, rounding out the top 10 of forwards here. Ovechkin is slated to top Tarasenko in the goals department, suggesting another 50-goal campaign is upcoming, compared to his compatriot's 45-goal projection, while Steven Stamkos is up for 42 markers, Joe Pavelski could hit 40 and Kane should be at 40 as well. The Hockey News has big things on the horizon for Alexander Radulov, as he joins the Montreal Canadiens in this circus, projecting him for 60 points this season. I don't have him doing half of that and that's where I'm prepared to take him. Among the rookie forwards, Auston Matthews could hit 65 points in Toronto, while Patrik Laine is down with 46 points in Winnipeg and Jesse Puljujarvi is also with 46 points in Edmonton. William Nylander in Toronto, Dylan Strome in Arizona and Mitch Marner, also in Toronto, are all projected above Laine and Puljujarvi this year, 55, 50 & 49 points, respectively. This certainly does have the makings of a good rookie race among forwards. I have a feeling that we'll see a better brand of offense from the blueline this season, but the Hockey News doesn't seem to be so sure. Sure, Erik Karlsson is projected to have a 77-point season, a top 10 skater, but the drop Brent Burns down to 64 points, Oliver Ekman-Larsson rises to 61 points, Roman Josi and Kris Letang finish around 60 points and P.K. Subban sticks with 59 points, rounding out the top six. Some of the surprise notes in their list include a guy like Shayne Gostisbehere, who appeared to be nothing less than a dynamo, they now have as a regular Joe Schmoe, down with 43 points, well down in the rankings. I don't think it was surprising that they projected Shea Weber to have less points than Subban this season, but only 47 points seems a bit low. Everything else, you could make somewhat of an argument for, I suppose... although the difference between Duncan Keith and Brent Seabrook, 47 & 39 points, seems a bit of a big gap. Maybe that's just me then. Overall, it is a fairly comprehensive magazine, which is generally worth it's value in reading, even if it is only used as a preseason gauge to the rest of the season. I would always recommend that you do up a comprehensive list of your own, just to make sure you're getting what you really want, at times that you feel more comfortable taking players and then using guides like this or my own projections as helpful hints or suggestions, throwing large grains of salt at them as well. This one still remains the best one out there, even though it isn't quite as dynamic as a blog site and has to be done pretty early to make publication dates. On Tuesday, the Ottawa Senators finally came to terms with defenseman Cody Ceci, as the two sides signed off on a 2-year bridge deal, reportedly worth $5.6 million in total. According to some reports out there, Ceci's side was looking for an immediate long-term deal, somewhere in the 6-year range, but one could argue that his numbers have been decent, but not where the team would him to be to secure him for the long haul. When this 2-year deal is complete, he will remain a restricted free agent and he will have arbitration rights, where he could really get a nice payday. About his numbers, his 2016 season was good, but wasn't awesome. In 75 games, the 22-year old finished with 10 goals and 26 points, which was still good enough to be 59th overall in defenseman scoring, but wasn't going to earn him that long-term deal. His potential still has some road to be reached and I think there is an upside to his game that the Senators haven't seen and this deal will help motivate him to get there. The current projection on him in my numbers is 30 points, a number that still has some play to it, for sure. Those projected 30 points would have him in the 11th or 12th round in my last mock draft and getting him there could be a real bargain. The cap hit on Ceci's deal is very reasonable, especially given the upside that this kid has offensively. The Senators will be prepared to pay him appropriately, but his $2.8 million right now is a much better reflection of what he has done, more than what he will be worth, but he'll get that in the Summer of 2018. The 23-man roster, in colour above, is now coming in with $6 million and change before they hit the salary cap ceiling, which will leave them lots of room to make some moves, if necessary, closer to the deadline or even before. The Senators have some young players that could easily slip into those blue spots and really make this roster interesting. The off-season core muscle surgery that Dallas Stars forward Jamie Benn undergone will indeed keep him out of the World Cup of Hockey and he was replaced today by San Jose Sharks forward Logan Couture. When the surgery was originally announced in the middle of July, the outlook was unclear as to whether or not Benn would have been able to participate in the tournament, but it looks like the Stars and Hockey Canada are going to take the cautious approach to his recovery and why wouldn't they? The two sides are only dealing with an MVP finalist and the regular season is far more important than this exhibition tournament. Couture is coming off a very good Stanley Cup Finals run, where him and his Sharks did fall short of the overall goal, but this tournament should help him to get on track for a much better 2017 regular season, trying to improve upon his 36-point total (52 games) in the 2016 season. It may have been announced a little while ago, but it didn't really get a feature on the blog when it happened, but the 2017 Winter Classic will go in St. Louis this season, where the Blues will face the regular opponent for this extravaganza, the Chicago Blackhawks. At the beginning of August, shortly after the Heritage Classic announcement, the league showed off the look of the new logo for the Winter Classic, which is set to go on January 2, 2017 this season. Unfortunately, there wasn't any immediate looks at the logos that the two teams would be using for this game, like we had for the Canadian game. Thanks to 27 hockey pool teams last season, the Winter Classic between Boston and Montreal featured 29 players in the hockey pool, some of which didn't play, due to various reasons, like injury and being in the minors, but that was still a lot of picks to be noticed in this game. This time around, it could be very much the same, as the Blues and Blackhawks are both likely to be very popular at this season's hockey pool draft in October and we will have at least one opportunity to change up players. In a mock draft done today, done to my early projections, with 27 teams again for the coming year, I have 24 players taken from these two teams, including four players taken in the 1st round. I am just polishing off the finishing touches to my mini-games post, where there is a chance that a game like the Winter Classic may have some meaning in the mini-games for the coming season. Stay tuned! As you may have noticed, we're counting down to the World Cup of Hockey draft date on the right side of the screen. We are less than three weeks away from the draft itself, which isn't far away at all. Excitement is starting to ramp up a little bit, as Sportsnet's marketing campaign is really hitting its stride, so you won't be able to get away from it, if you're watching Jays games or something similar. With all of that being said, Sportsnet has now released the calendars for all the pre-tournament action, including the practices and exhibition games. Everything appears to be getting started on September 5th, when all of the players start reporting for their mini-camps, likely to assess the team's strategies and plans for the tourney itself. There won't be a great deal of coverage on the blog, it will be saved more for the roster moves, if there are injuries and other miscellaneous moves. Everything that will be covered on the tournament itself, will be easily accessible by using the tag for the World Cup, which you can see here. We've already seen some player movement, so stay up to date. Roster sheets will be provided at the draft, so everyone will be prepared the same way, come draft day. It should be a fun one, I'm thinking. It will certainly give me a good dry run for the main show, which will go on October 8th. Looks like we're going to have a good goalie battle going on in Toronto this Fall, as the Maple Leafs have added Jhonas Enroth to their roster, signing him to a 1-year, $750,000 deal on Monday. The 28-year old will battle against Garrett Sparks for the back-up job behind Frederik Andersen this October and having some veteran experience, should help his cause in earning the job. Last season with the Kings, Enroth appeared in 16 games, registering 7 wins and 2 shutouts for 18 points in hockey pool terms. Until there's a clear winner for the job, I currently have Enroth and Sparks splitting the back-up hockey pool projections, each taking 10 points. This would keep them both down in the rankings come draft day, but these projections will change as we get to know more about the team, as it unfolds. Jimmy Vesey, the former Nashville 3rd round draft pick realized his marketability at some point in the 2016 season or possibly even earlier, opting to take advantage of a loophole in the NCAA/NHL relationship, whereas finishing your collegiate program will allow you to opt for unrestricted free agency, much to the chagrin of the team that initially drafted you. Officially, Vesey and a couple handfuls of other collegiate players all became UFA's on August 15th, which would allow these players to negotiate freely with other teams. The 23-year old was patient and talked to just about every team and on Friday, he chose the Rangers. It is expected that Vesey will receive the rookie maximum with his new 2-year entry-level deal, which will pay him $925,000 for the season and act as his annual cap hit for the year. There will be a number of bonuses as well, which will be calculated out at the end of the year, which could have an impact on next season's cap number for the team. The Rangers management team seems to believe that the forward should be able to step right into the lineup through training camp and obviously, they have some high expectations for him as well. The most recent Hobey Baker Award winner is thought to be a solid two-way prospect with some offensive upside and could very well be one of those kids to watch in training camp. The Rangers have about three spots available in the forward ranks, but their depth up front doesn't show an immediate spot in the top six for the kid, unless he truly dazzles. The shoulder injury/surgery that Alexander Steen has been recovering from will keep him from playing in the World Cup of Hockey for Sweden next month and it was made official with the announcement that Anaheim Ducks forward Rickard Rakell will take his spot on the team. Steen underwent his surgery after the Blues were bounced from the playoffs, back in June, and his recovery time was going to be in the 3-to-4 months range, which may also force him to miss some time around training camp as well. Steen is trying to be ready for the start of the regular season and to do so, he would need a little bit more time on the shelf. The 23-year old Rakell had finished his second full season with the Ducks and he has been a solid contributor in those two full seasons, in the 2016 season he finished with 43 points in 72 games. He is currently a restricted free agent, but all RFA's will be eligible to play, thanks to the agreement for insurance on those players. With the tournament set to get started less than a month from now, it will soon be time to start thinking about camps and then the draft pool, which will be set to go on September 11th. The Calgary Flames' agenda for the Summer included having to re-sign a couple of their future pillars of the franchise, including centre Sean Monahan, who they were able to lock up on Friday morning, finalizing a 7-year deal, reportedly worth $6.375 million against the salary cap each year. The Flames' 1st round pick in 2013 (6th overall) has stepped in immediately for this club and has provided hope through some gloomy seasons that the franchise is starting to come back around and there wasn't going to be a bridge deal out of his entry-level contract, since his importance was so great. In the 2016 season, the 21-year old finished with 27 goals and 63 points in 81 games, ranking 44th overall in pool scoring, 27th among all forwards and forming an important duo with still unsigned RFA Johnny Gaudreau, this club really has something to build around. The early projections are still fairly modest for Monahan, who has been improving season over season and the improvement for the coming year will bump him up into the 65-point range, which should still be good for a 2nd round pick in this year's draft, possibly higher, depending on how good you think the Flames will be in 2017. Now, we wait for the Gaudreau signing, which still hangs in a little bit of limbo, as speculation suggests that he will be looking for the $7 million range, something the Flames would be hard-pressed to afford this season. The 23-man roster above, everyone in colour, is leaving $6.8 million in cap space for the coming year and you would have to remove one of those forward numbers when Gaudreau signs, which will give the team somewhere north of $7 million, so it will be tight. The Flames won't go into the season without him, but their negotiation skills will be put to the test to see how much flexibility they will get in this regular season. As of Monday, it was NCAA free agent season, where kids that finished their collegiate careers who didn't sign with their original draft team could opt for unrestricted free agency and it wasn't until Wednesday, before the first player signed. Former Flames draft pick, defenseman John Gilmour, opted to sign with the New York Rangers, getting a 2-year entry-level deal. Gilmour played four seasons at Providence, where he had a steady offensive career for his school, finishing with 23 points in 34 games in his senior season. The scouting report on Gilmour is that despite his size, 5'11" & 180 lbs., he is a strong defender with good instincts and offense upside. It will be interesting to see where he fits in to the Rangers' system. On Friday morning, another NCAA grad put pen to paper with another team that he wasn't drafted by, as a former Washington Capitals pick, forward Thomas DiPauli, opted for free agency and chose the Pittsburgh Penguins. DiPauli, 23, also signed a 2-year entry-level deal with the Penguins, terms and bonuses not disclosed right away. DiPauli isn't really scouted as great talent for the hockey pool, but he gets a mention, since it is that time of year. The winger is described more as a plucky two-way player and he could certainly find a role in the bottom six down the road, but I would imagine he would find some time in the minors before the jump to the NHL. And what's a top prospect post without a top draft pick that signs with his draft team? The Ottawa Senators signed the 11th overall pick in this past June's draft, forward Logan Brown, giving him the maximum 3-year entry-level deal, likely with the base cap hit of $925,000 and then the bonuses would be worked out at the end of each playing season. Brown is a big-bodied centre, who has all kinds of upside and this was a pretty good pick-up for the Senators, who don't boast a great deal of size through their lineup. The Senators certainly have some spots in their current projected lineup that could be considered up for grabs, which could make Brown a candidate for at least a tryout at the start of the regular season. He will certainly be one to keep an eye on through training camp. We can now officially add centre Matt Cullen back to the Pittsburgh Penguins' roster list and projections, as the player and team have come to terms on a basic 1-year, $1 million deal for the 2017 season. Cullen is a 2-time Stanley Cup winner, with Carolina and most recently with Pittsburgh in June, is a veteran of nearly 1,300 games and should be able to still provide depth down the middle, in a bottom six role, but still quite serviceable. Last year, Cullen played in all 82 games, scoring 16 goals and 32 points, and was right in the midst of the pool worthy forwards, ranking 184th. Of course, with age, the point projections will take a bit of a tumble and Cullen, 39, should continue to trend downwards, as his role diminishes and his ice-time falls away, but there is still some expectation out there for him and I still think 30 points is a very attainable number for him, especially given that the Penguins are home to many injury prone players and his role could improve through injury. I wouldn't go too crazy in trying to pick him up too early, rather he would be your last forward in the draft, if anything, but I don't think he could possibly hurt your pool team in that role. The Penguins and their cap situation is going to rely heavily on the Long Term Injured Reserve relief, as they gone over the cap ceiling by about $3.25 million and they can use the $3.75 million that Pascal Dupuis has left on his current deal for the season to help them out. Obviously, taking a $1 million deal was one of the only ways that Cullen was going to re-sign with the team this season.